Most evenings, between 8 and 11pm, Steven can be found in the hobby shop creating jewelry. "Each night, when I first go into the shop, I lay everything out--all my jewelry-making supplies," he says. "I pray a little bit and start to work. I just put things together and see what happens." Steven often works alone and enjoys the solitude. Occasionally, though, fellow jewelry designers join him. "When we're together, we inspire each other. We bounce ideas off each other and then come up with new ones. There are four or five here who do stones and beads," he says. Passionate about designing jewelry, Steven would make more time for this work if he could. However, he's also a graduate assistant tutor for the New Orleans Baptist Theological Seminary, as well as a clerk in the Classification Department at the Louisiana State Penitentiary in Angola. Steven is also an inmate in this facility, and has been since 1990. Despite his very busy schedule, Steven still finds about 15 hours a week to create jewelry. Steven started making jewelry in 2007. Originally, he did woodworking in the facility, but became disenchanted with the process. According to Steven, "I wasn't enjoying woodworking. The items are cumbersome and take much too long to finish," he says. "So I started looking around for something else." He'd heard good things about the jewelry shop program. Jewelry-making "keeps guys busy in their off time. It's very therapeutic for guys to stay busy and not let their time go to waste." Steven decided to explore the jewelry program. "I started with a small box in the hobby shop," he recalls. "I found a Fire Mountain Gems® catalog and ordered jewelry stuff. The tools were inexpensive. I ordered a few hundred dollars worth of stuff, gemstones and wire, and I started experimenting," Steven recalls. "Fire Mountain is the only company I do business with. You have the best discount program on bulk purchases. It works well for what I do. I buy so many different items but I don't have a lot of storage or resources. I can get one each of two hundred different items and get the bulk discount. I can expand inventory without buying too much of one item." Family considerations also influenced Steven's decision to start making jewelry. "I have 8 sisters, 16 nieces and 4 aunts. I figured that jewelry makes great gifts." So, with aspirations to make gifts for the women in his family, Steven dedicated his efforts and energy to learning jewelry design. The first jewelry gift he made was for an aunt. "I made her a glass bead and pearl necklace and earring set. That was in 2009. She loved it." Steven started making jewelry without the benefit of classes. "I'm pretty much self-taught. The Fire Mountain catalogs have very nice tips in them about how to bend wire and how to do a lot of different projects. I found a few jewelry-making magazines. It's not hard, if you pay attention to detail," Steven notes. "Looking at jewelry that people wear is where I get my biggest inspiration these days," Steven notes. For his latest designs, Steven uses natural stones such as jasper and jade, along with freshwater pearls. "I still make a lot of necklace and earring sets. I use hematite as the base stone for many of my designs. Hematite gives a nice background color. It goes with everything," he observes. Steven is thoroughly committed to making a quality product. "I was thrilled when Fire Mountain started selling silver-filled because I can still provide the highest-quality product. It's great how you continue to expand the product line. The product has stayed up with the trends." Steven sells his jewelry through several venues. Employees can purchase his designs and he also sells through the facility's visitor centers. In addition, Steven sells his work at the facility's rodeos, which run every Sunday in October and the last weekend in April. Open to the public, Steven says the rodeos are terrific for sales. "The rodeo is great for me. I sell 95% of everything I make there." Recently, Steven started making rosaries. "They've been popular with all of my customers, including at the rodeos. When I make the rosaries, I always use 4mm hematite beads as spacers. Then I choose from over 40 different types of 8mm and 10mm mountain and river stones, along with other beads. I use black obsidian and black silk stone, onyx, 8 or 9mm pearls, jade and jasper." "Black is popular." says Steven. "Black onyx is my personal favorite. I like the way it shimmers. It shimmers beautifully with hematite. Onyx and white magnesite are another pretty combination." Just five years after ordering his first box of supplies and making that initial gift for his aunt, Steven's jewelry-making world has flourished. He now has a cabinet and his own set of shelves in the facility hobby shop. Steven also teaches new jewelry makers. 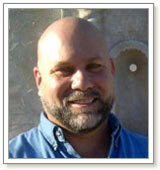 "I just started teaching a new student in the last few weeks," Steven shares. "My student is dedicated to the same quality I'm committed to. My student is already a talented artist. Another thing jewelry has allowed me to do, expand my appreciation of art. I was never able to draw or paint and I've grown in my understanding of the artist's process." In December, Steven completed his most meaningful project since he began jewelry-making six years ago. A seed of inspiration for the project was planted early last fall when he heard about the upcoming dedication of a new Catholic chapel in Angola. "After I heard about the dedication, I talked to the warden. I told him I'd like to make a donation." The warden appreciated Steven's offer and told him he'd let him know. "When he got back to me, the warden asked if I'd make rosaries for the chapel's donors. Of course, I said 'yes' but I didn't think to ask the warden how many rosaries it would be. I expected he'd ask for eight or ten." However, the warden requested forty rosaries, one for each of the forty chapel donors. Steven was astonished. With only a few days before the dedication, it seemed the deadline to complete the rosaries was much too short. "I really wasn't sure I could do it. I thought maybe I'd take my offer back. But I prayed and God spoke to me and said, 'You made an offer. If the sacrifice is greater than what you thought, are you going to back out?'" With help from his new student, and some nearly all-night jewelry-making sessions in the hobby shop, Steven finished all forty rosaries. A project for Steven that was both daunting and an honor. 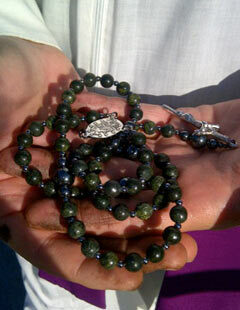 His beautiful rosaries were presented to the donors at a mid-December dedication of Our Lady of Guadalupe Chapel. In a few months, Steven will be 50 years old. Though currently serving a life sentence, he'll be eligible to go before the pardon board next year. If pardoned, Steven says he'll continue making jewelry. "I don't think I want my own shop but I'd like to show in markets and festivals," he reflects. And, if a pardon isn't granted, "I'll continue to do and enjoy the work here. It's very therapeutic for me, to work by myself." According to the assistant warden, Steven is considered exemplary by those who know him. Steven reflects on this respect and admiration from staff and fellow inmates. "I maintain a high moral standard. I try to be a positive influence, try to stay out of trouble and follow the rules of the community. You have to have positive influences in a community and that's what I try to do." Since entering Louisiana State Penitentiary, Steven's accomplishments are immense, including a four-year degree from the New Orleans Baptist Theological Seminary. Steven has also become a self-taught jewelry designer devoted to his art, an encouraging teacher and a successful entrepreneur. He shares his talents and gives generously to those around him, as well as to the greater community of Angola. Steven has reinvented his life, starting with a small box of jewelry-making supplies from Fire Mountain Gems and a profound dream for a new beginning.